Zebras are only found in the wild in Africa. They used to roam the entire continent, but now are found only in the south. There are three main species of zebras, which all have sub-species and can all interbreed: They are the plains zebra (Equus quagga), Grevy's zebra (Equus grevyi) and mountain zebra (Equus zebra.) Zebra breeding behavior is very much like feral horses, feral donkeys and wild asses. Female zebras can come into their first mating seasons as soon as they are 1 year old and still nursing from their mothers (dams). They usually will not get pregnant until they are at least 2 years old, however, and are not sexually mature until they reach the age of 4. Males may not get the chance to breed until they are much older, depending on how many mares a dominant stallion can control. Zebras stay close to other herd members but will join larger herds for protection during the annual migration, according to National Geographic. Breeding season is January to March, which coincides with the rainy season and the growth of new plant food sources. Mares come into heat during this time. Their season can last more than a week, just as with horses. However, no matter how often the mares mate, they will not get pregnant if they do not mate at their most fertile period, according to "East African Mammals." Zebra mares gestate for 11 to 12 months. They usually give birth, or foal, during the night, when there are fewer predators around. The female zebra will typically move herself away from the herd and lie on her side to foal, although some zebra mares may are able to foal while standing. The newborn foal can stand up and run within an hour. 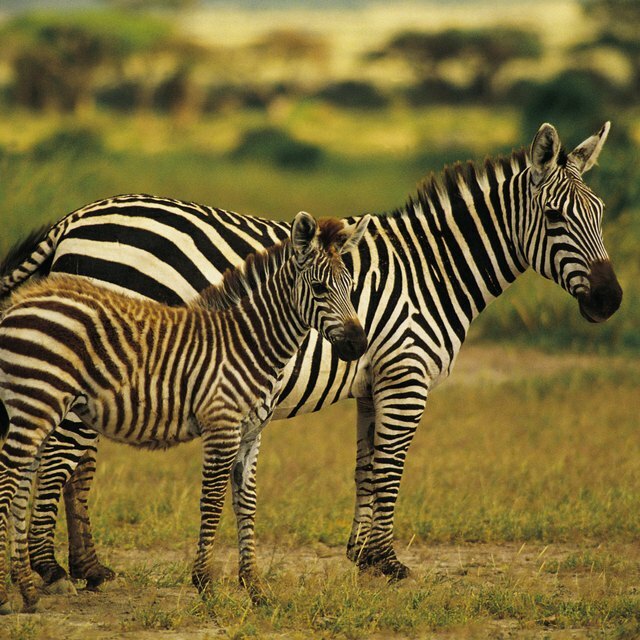 Zebras nurse their foals for an average of 16 months, according to Zebra Learning Zone.com. Zebras can breed not only with other types of zebras, but also with horses, ponies and donkeys, as all of these species engage in the same sexual behavior. Crosses between zebras and horses are called zorses. Crosses between zebras and ponies are called zonies, and crosses of zebras and donkeys are called zebrasses or zedonks. However, like mules, the offspring of these pairs are sterile. One extinct species of zebra, called the quagga, may not be a separate species of zebra, as previously believed, according to the PBS series "Nature." DNA samples of a remaining quagga hide match DNA from plains zebras. 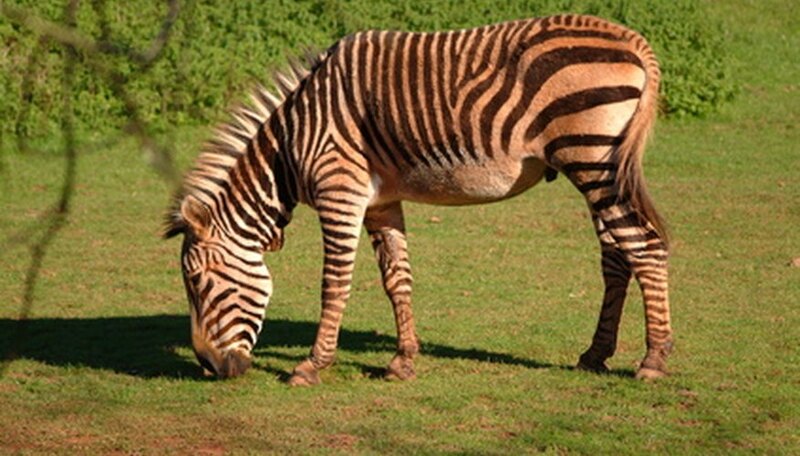 This suggests that the quagga was a zebra of a different color. Researchers are attempting to breed a zebra with the quagga coloration, since many zebras have brown stripes or patches of brown rather than the typical black and white coloration of the majority of zebras. Sherwood, Rena. "Zebra Breeding Facts." Sciencing, https://sciencing.com/zebra-breeding-7222062.html. 25 April 2017.